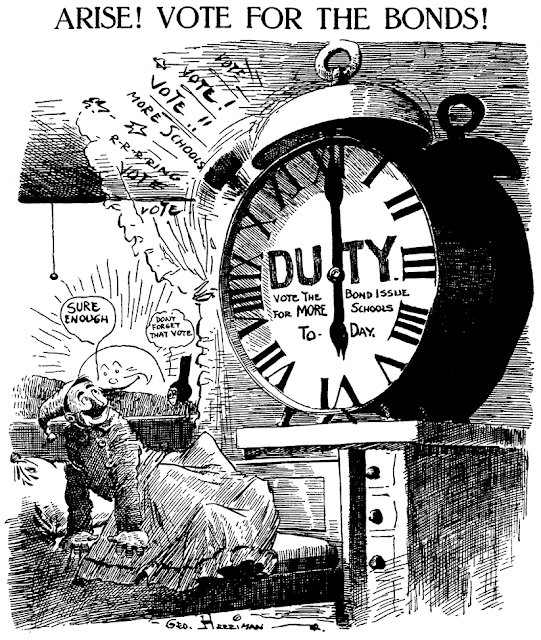 January 6 1909 -- It's voting day, and Herriman makes one last pitch for Angelenos to fund new schools for the city. This series of cartoons had me curious; eventually, I did find that the Los Angeles Herald is on line, digitized, and I was able to find out how things turned out. Here's one from Percy Crosby that has no maker info. It is divided back and postally used in 1911. The forehead tattoos, needless to say, were added by the postcard sender. What does the lightning bolt labeled "Hurryup" mean??? Could be the letters were also blackened by the sender. Sort of a remix. James H. “Jim” Lavery was born in Hartford, Connecticut, on November 23, 1888, according to his World War II draft card and The Official Roster of Ohio Soldiers, Sailors, and Marines in the World War, 1917–18 (1926). A family tree at Ancestry.com said his parents were George Lavery (1864–1926) and Elizabeth O’Malley (1867–1906). In the 1900 U.S. Federal Census, Lavery was the oldest of eight children whose parents were Scottish emigrants. They resided in Cleveland, Ohio at 21 Indiana Street. Lavery’s father was a machinist. Information regarding Lavery’s whereabouts in 1910 and art training has not been found. A profile in Editor & Publisher, November 10, 1917, explained what Lavery was doing, how he ended up in Cleveland and became a cartoonist. …Jim is a typical Press find. Two or three years ago he had never drawn a picture that saw the light of day in the printed page. As hinted before, he was painting signs, and thereby met the high cost of living with considerable ease. His activities in that branch of brush and ink work might read like a travelogue, for he painted signs in every big city in the country, from Maine to California, with the exception of Cleveland. When he hit Cleveland he went to work on a sign, and as variety interspersed some pictures with the wording. These pictures James admitted were funny. Whether any one else thought so or not, they were sufficient to attract the attention of Ollie May, Leader cartoonist. May and Lavery got acquainted. Lavery wished he could draw for a newspaper, too. Just then the editor of the Press made it known he could use a first-class cartoonist, and Lavery was ushered into the sanctum sanctorum. “Go to work,” said the E. And James did, and has been doing that little thing ever since. He has invented Some quaint characters which give the Press distinction. He invented the Wampus Cat, which blats about sport topics in rhyme; George Davis’s short shavings have finer wit because of the Lavery sketches that go with them; leading lights of Cleveland cannot escape his quaint strokes. In 1917 Lavery married Myrtle Lillie on March 22, according to the Cuyahoga County, Ohio, Marriage Records and Indexes at Ancestry.com. Lavery signed his World War I draft card June 5, 1917. He was described as medium height and build with blue eyes and light-colored hair. The Official Roster of Ohio Soldiers, Sailors, and Marines in the World War, 1917–18 had this listing for Lavery: “Co D 309 Engineers to Discharge Private, first class 20 Sept 1918. American Expeditionary Forces 9 Sept 1918 to 30 May 1919. Honorable discharge 24 June 1919.” The 1917 Cleveland city directory said Lavery resided at 11308 St. Clair Avenue NE and was a Cleveland Press cartoonist. Moving Picture World, December 1, 1917, said Universal Current Events, filmed 39 cartoonists including Lavery. The 1920 census recorded Lavery in Cleveland at 628 East 130th Street. Lavery was in his father-in-law’s household. 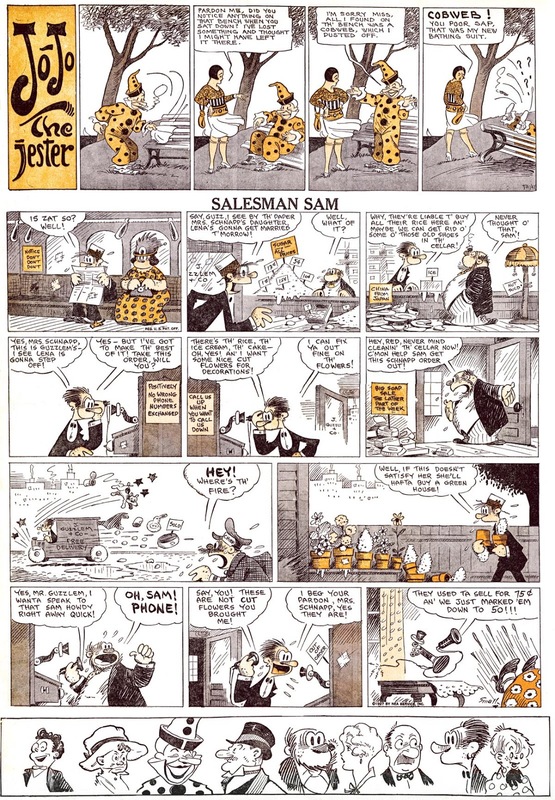 American Newspaper Comics (2012) said Lavery drew the Salesman Sam topper, Jo-Jo the Jester, from October 10, 1926 to October 2, 1927. Lavery was recorded twice in the 1930 census. One sheet had the 1920 address while the other one had the house number as 626. Lavery, his wife and daughter Jean were the sole residents at both addresses. Lavery’s address was 626 East 130th Street in the 1940 census. Lavery was a self-employed cartoonist. On April 26, 1942, Lavery signed his World War II draft card which had the address 14749 Elderwood Avenue. Lavery passed away November 3, 1959, in New York City. I think it should be: George Lavery (1864–1926) ? Yes, you're right. Date corrected. 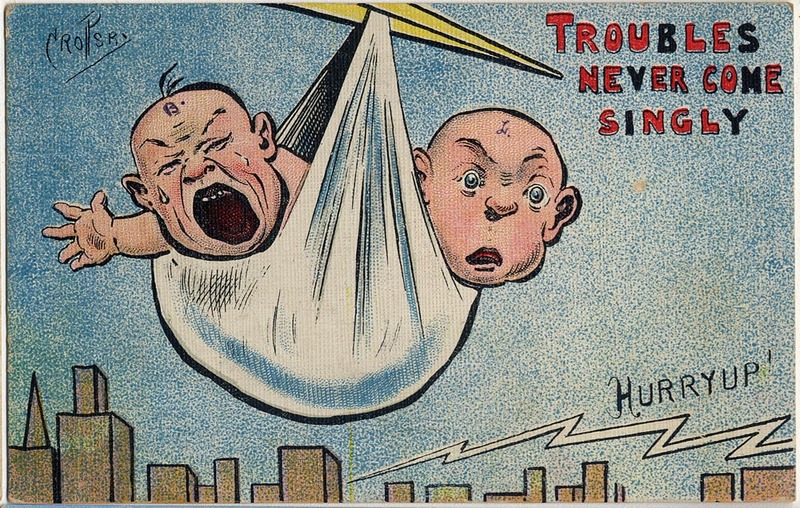 In the 1920s, when NEA expanded its comic strip reach into Sundays, they followed along with other syndicates when it came to adding toppers in 1926. They had one original twist to the idea, though. Instead of assigning the cartoonist of the main feature to create the topper, they pulled someone else from the cartooning bullpen to do those honors. 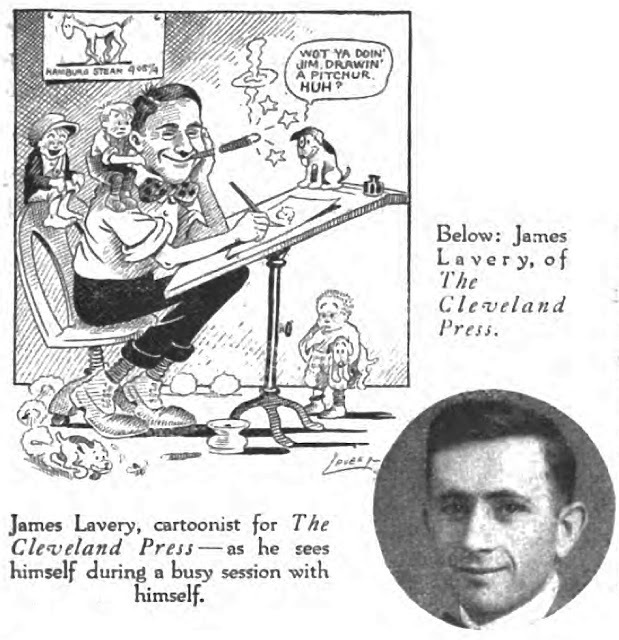 Jim Lavery was a perfectly creditable sports and editorial cartoonist for the NEA syndicate, but when he was tapped to provide a topper strip for C.D. Small's Salesman Sam, boy did they find out he was not cut out for straight gag work. I get the feeling that NEA expected great things out of him, but what they got was hackneyed joke book swipes inartfully told. Maybe Lavery just didn't want the job, and was dogging it on purpose. Jo-Jo the Jester stars a braying fool for no other reason than to let people know who's telling the joke -- hey, it's the guy in the polka dot jammies! Sometimes that was a really useful sign on Lavery's worst klunkers. I read through about a dozen Jo-Jo gags before selecting the one above as the only one that offered me a hint of a guffaw. What can I say -- any hint of naughtiness and I'm an easy mark. 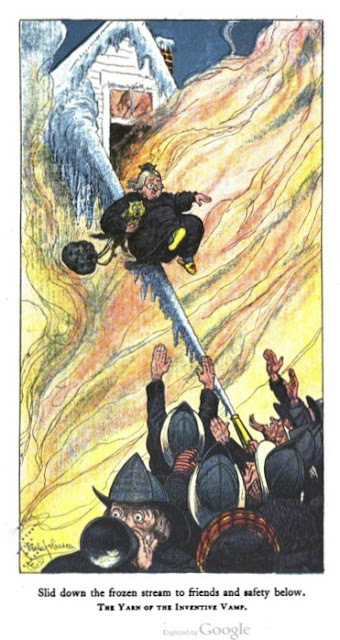 Lavery produced Jo-Jo the Jester for one year before the powers that be took pity on a nation not getting any laughs, from October 10 1926 to October 2 of the next year. After that, Irving Knickerbocker took over the space with the inelegantly named, but at least somewhat funny, J. Disraeli (Dizzy) Dugan. "Doonesbury" did a similar gag much better sixty years later, when Boopsie became a model for the Sports Illustrated swimsuit issue. Editor: "Let's have you try on the swimsuit now, okay?" Boopsie: "Okay. Where is it?" Editor: "Uh... I just gave it to you." Boopsie (looking in her hand): "This? Oh, sorry, I thought it was dental floss." Wow! I couldn't disagree with you more, Allen. That Topper joke is hysterical! Merle DeVore Johnson was born in Oregon City, Oregon, on November 24, 1874, according to Who’s Who in America (1912), American Art Annual, Volume XIV (1918) and the American Literary Yearbook, Volume I (1919). Johnson’s parents were William Carey Johnson and Josephine DeVore. In the 1880 U.S. Federal Census, Johnson was the youngest of three brothers. Their father was a lawyer. The family resided in Oregon City on Center Street. Who’s Who said Johnson graduated from Stanford University in 1897. Johnson was on the staff of the school newspaper the Daily Palo Alto which noted his chess victory but team loss. Information regarding Johnson’s art training has not been found. The 1904 Stanford yearbook, The Quad, mentioned Johnson as an illustrator. The Junior Quad was instituted by the Pioneer Class in 1894. In this annual the artistic talent of the University finds scope, and the various virtues of Francis, Culver, Bristow, Adams, Merle Johnson, Borough, Bowman, Miss Holly, Sterrett, and the later illustrators are abundantly attested in the ten picturesque volumes. An 1898 San Francisco city directory listed Johnson as a Chronicle newspaper artist who resided at 1031 Vallejo. The following year Johnson was with the Examiner newspaper and at the same address. The 1900 census recorded artist and illustrator Johnson in San Francisco at 1317 Octavia. City directories dated 1901, 1903 and 1904 said he was with the Examiner. Who’s Who said Johnson married Margaret Keough on September 7, 1905. The San Francisco Call said Johnson was a New York resident at the time. American Newspaper Comics (2012) said Johnson produced two series in 1907 for the American-Journal-Examiner, When Antoinette Is on the Job and He’s Stuck on Angeline. From 1906 to 1910, Johnson produced several comics for the New York Evening Journal including an untitled series about clothes and fashion; Frog He Would a-Wooing Go; It Happens Every Day; Hint to Wooers; Something Always Happens; and When Women Are Stronger Than Men. 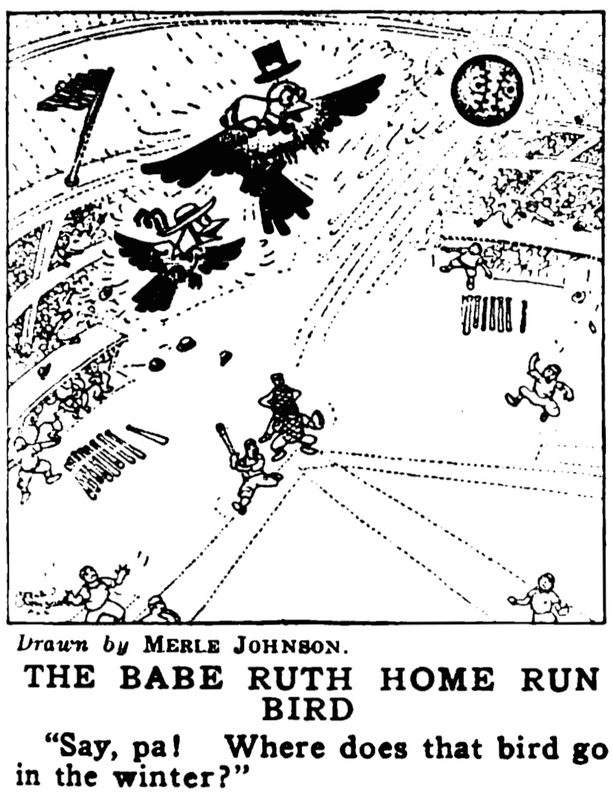 Johnson drew The Boy Scouts—Bill and Bobbie which ran from November 29, 1914 to May 16, 1915 in the New York Press. According to the 1910 census, Johnson was a newspaper artist who resided with his wife, two daughters and mother-in-law in Queens, New York, on Pine Street. In 1910, Johnson was the manager of the New York Evening Journal art department. The Stanford University Alumni Directory and Ten-year Book, Volume II, 1891–1910, said Johnson lived in Douglaston, Long Island, New York. Who’s Who had his office at 238 William Street. The 1915 New York state census said the Johnson family and two servants were on Cherry Street in Little Neck, Queens, New York. Johnson’s occupation was illustrator. The Fourth Estate, February 20, 1915, noted Johnson’s new business deal. Merle Johnson, cartoonist of the New York Evening Journal, contributor to Puck and other publications, has contracted with Joseph S. Edelman, president of the Sterling Advertising Service, for the right to use his services of commercial purposes. 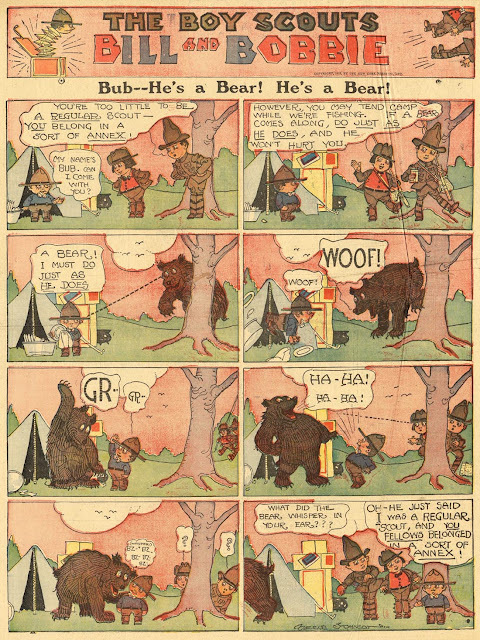 According to The Artist and the Child (1980), Johnson was a cartoonist for Puck from 1914 to 1917. On September 12, 1918, Johnson signed his World War I draft card. His address was Cherry Street in Douglaston. He was employed as art manager at Wilson Service, 500 5th Avenue, New York City. Johnson was described as short, medium build with brown eyes and dark hair. Johnson’s books include A Ball of Yarn (above), A Bibliography of the Work of Mark Twain, Samuel Langhorne Clemens; A Bibliographic Check-List of the Works of James Branch Cabell 1904–1921; and Howard Pyle’s Book of Pirates. 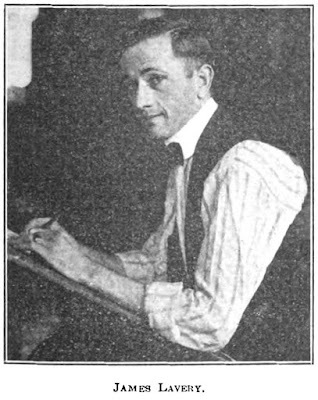 Johnson was a freelance illustrator in the 1920 census. His address had not changed. The 1922 New York city directory listing for artist Johnson said he resided at 45 Washington Square South and worked at 1440 Broadway. 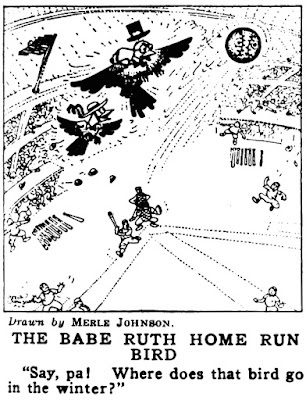 Johnson contributed illustrations to the New York Tribune from 1921 to 1922. Johnson’s wife and daughter Marion applied for a passport on August 1, 1923. The family residence was on Second Street in Bayside, New York. According to Who’s Who in New York City and State, Volume IX (1929), Johnson’s residence was 42 Commerce Street and studio address 243 West 34th Street, in New York City. Johnson has not yet been found in the 1930 census. The Stanford Illustrated Review, March 1933, published this item about Johnson. Merle DeVore Johnson, early an artist on the San Francisco Chronicle, then for fourteen years head of Hearst’s art department in New York City, and in more recent years a commercial artist in that city, has a bookstore across the street from the Pennsylvania Railway station and deals in first editions, in which he long has been a recognized authority. For years he was tennis champion of Long Island. His elder daughter, Helen, under the screen and stage name of Judith Wood, is now playing the part of Kitty Packard in Dinner at Eight. According to the New York Times, June 2, 1935, Johnson suffered a fractured skull when he was struck by an automobile. Johnson passed away September 1, 1935, at his home in Manhattan, 65 East 53 Street. The cause was pneumonia. His death was reported the following day in the Brooklyn Daily Eagle and the Times. The Boy Scouts of America was an organization just four years old when Merle Johnson gave them a gently humorous poke in The Boy Scouts Bill and Bobbie. The Sunday strip began on November 29 1914 in the New York Press, a second-rate paper run by Frank Munsey. In the Press's short-lived Sunday comics section (Munsey soon decided Sunday comic sections cost too much to produce) this strip was one of the headliners, along with Dorothy and the Killies. 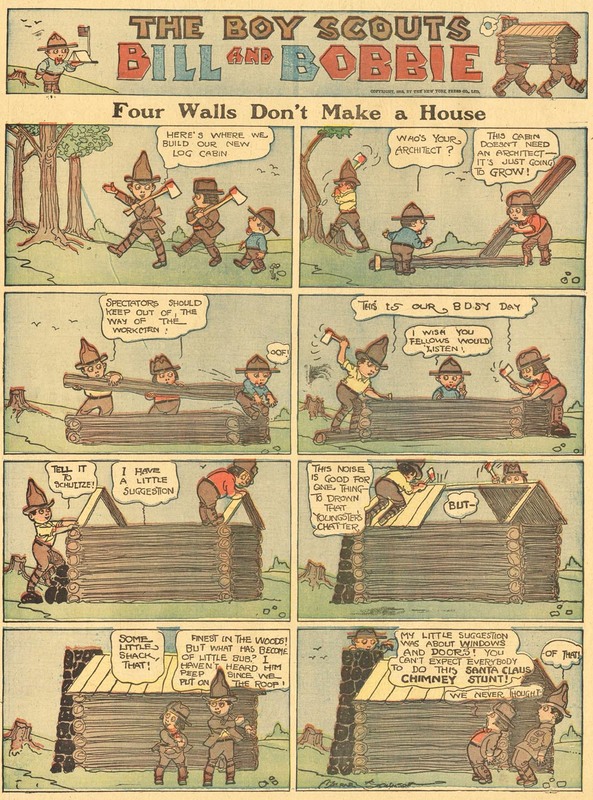 Merle Johnson had pretty much left comic strip work behind by 1914. He had a number of features picked up by Hearst in the 1900s, but this is his only series I know of from later than 1910. Bill and Bobbie was drawn in Johnson's signature naive style, and the simplistic gags actually worked surprisingly well, undoubtedly because they meshed well with the art style. The whole package was quite attractive, and may well have helped to sell a few copies of the New York Press to readers who would have otherwise never even looked at the Munsey rag. The Boy Scouts Bill and Bobbie ran until May 16 1915, when the whole comic section was cancelled. Thanks to Cole Johnson, who supplied the scans. The punchline to the first strip is actually hilarious. Don't see too many that from from around that time.